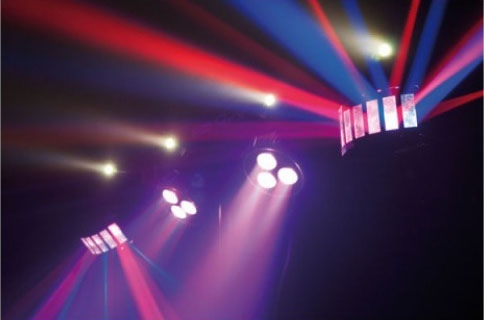 The Showtec QFX combines LED RGB spots, Derby fx, a Laser and a Strobe effect onto a single control bar. QFX maximizes convenience and ease of set-up and take-down for mobile entertainers who want to create a dynamic lighting experience for any event. The RG laser has many versatile grating & burst effects and is equipped with a key lock and remote interlock. 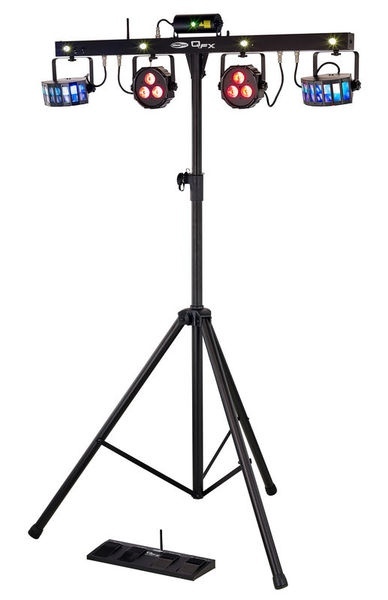 The strobe has 4 sections with different preprogrammed patterns. The LED spot and Derby FX have RGB colors can be selected individually or in many preprogrammed combinations. The system is complete including a tripod stand, wireless footswitch, IR remote and carrying bags to protect the set during transport. The QFX controller bar features phenomenal built-in automated and sound-activated programs that include all 4 effects to make one complete show.